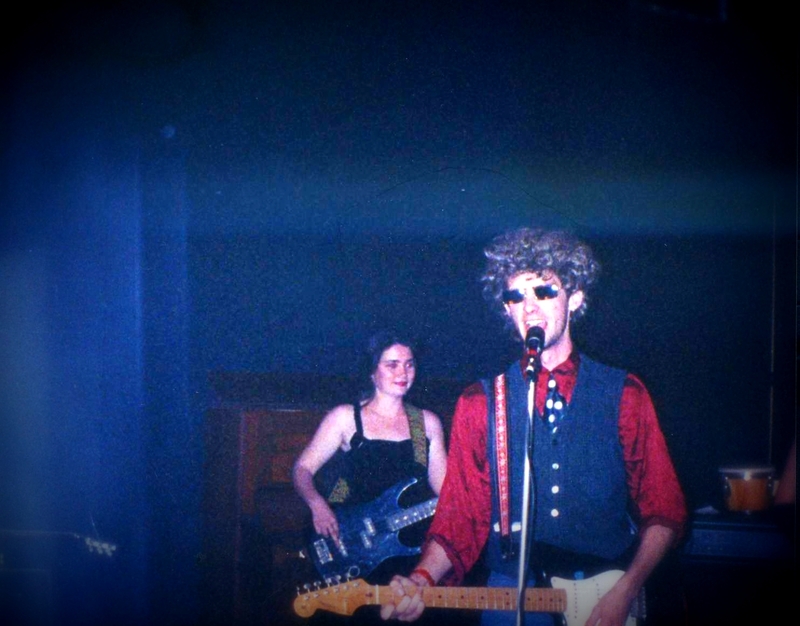 My first band. A cat in a cutlery draw. Peace dog. The music stops. A bar of soap thunks onto the share-house carpet. Who threw that? Where were we? Oh, that’s right, we don’t know. A charming name for a band.We came together at university. 1998 0r 9. The title was Julia G’s. She wanted to write, and had decided she wanted to play bass. Julie’s William’s voice, wherever she found it, had a bold streak of Janis Joplin. Later she played harmonica and bongos. Susan played drum. Just drum. Singular. Brushes and snare. We were all doing Drama. Later came the mysterious Adrian on lead guitar. Julie W loved the blues. Angry, love-gone wrong lyrics poured out of her. Julia’s stuff was more quirky. We wanted to perform our own stuff too, so I worked to set their ideas to original music. In the meantime we rehearsed in the sticky-carpeted lounge-rooms of share houses, working up covers. Janis Joplin’s Turtle Blues. Ray Charles’ I Believe (which I’d learned via the Hunters and Collectors version.) Dear Prudence. I remember sensing, really for the first time, as we gathered around the songs, the centripetal force of a band. Clumsily fumbling for the interpersonal subtext. Wanting to have fun and work. Softly wrestling with roles and goals. Being bossy. Drinking beer. Smoking cigarettes. We sounded pretty rough. I distinctly remember one rehearsal in a share house in Red Hill, where we were slamming through one song or another, probably sounding like a cat thrown into a cutlery draw. A thud. The music stopped. Somebody’d thrown something into the house from the street. There it was. On the brown carpet. A bar of soap. It was a high set house. Thrown from the street, it would have been quite a shot to make it through the door like that. We’d worked up a set. Originals and covers. 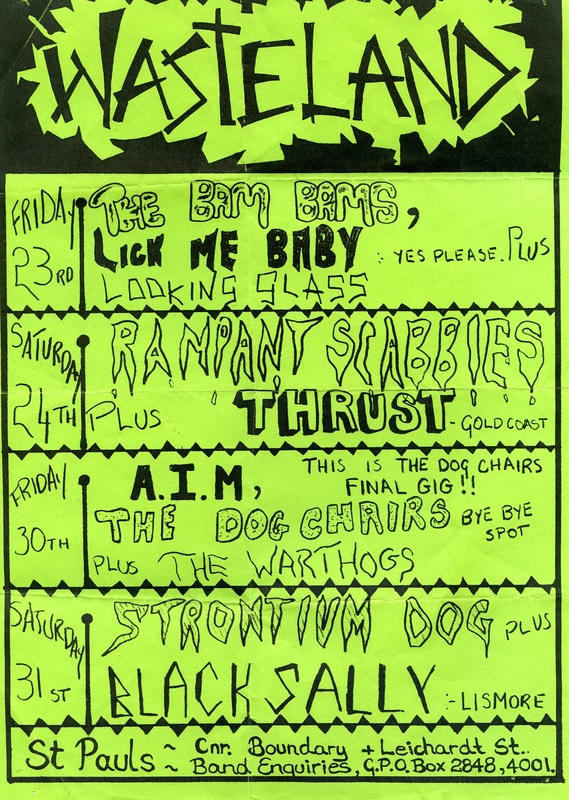 Then the first gig. It was in the university theatre, the Woodward Theatre, at the end of a feminist cabaret. We played as a trio. Later we finished a party in the same venue as a full band. There was lots of drinking and smoking. And people danced. That was unexpected, as we were still having trouble hanging on to a groove ourselves. We did a cover of the Cult’s Peace Dog with Julie’s friend Barbara Fordham (with whom I’d later form The Goodbye Notes) singing. One of our lecturers, Donald Hall was dancing. I thought wearing a wig and glasses might improve things. Susan, on ‘drum’ wore a frock and elbow-length gloves,adding a much needed touch of sophistication. It was risky, because we weren’t that ‘good’ but we were brave enough to have a go anyway. Performing in a band was… fun. We should do it again. So we did a pub gig. 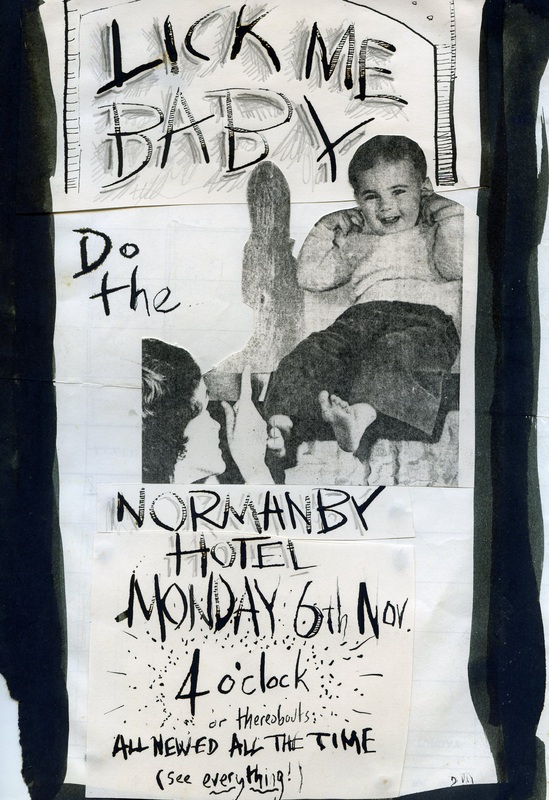 There was a stage in one of the bars at the old Normanby Hotel. The one where the old blokes quietly had a beer. The pub agreed to have us, probably thinking we were mad students or something, which we were. A poster was made. We set up. We were nervous. Restless. People came. We played. It was OK, but didn’t feel right. Did we translate the energy we’d experienced from the theatre to this scungy pub? No. Someone who’d come to see us stole a very large leg of ham from the kitchen while we were playing. The band was implicated, so we left without collecting our fee. 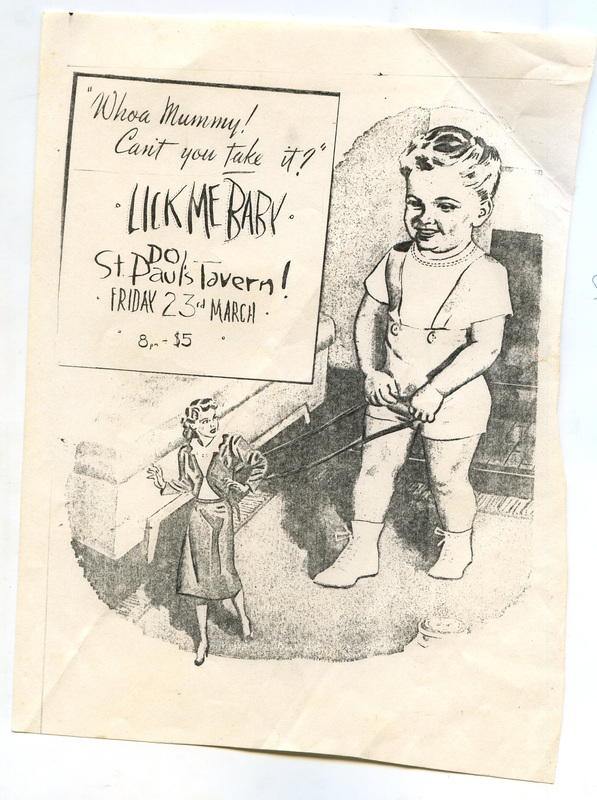 Bands played at St Paul’s Tavern. I knew this from reading the street music papers. I would get us a gig there. I phoned some guy. He said yes. I asked if there was a soundcheck. I asked what time we should turn up. He was vague and hung up. A poster appeared. One I didn’t make. It was happening. Being used to the ‘hour call’ theatre time, I arranged for the band to turn up an hour before the guy had said the sound check might happen. The venue was closed. We sat on the stairs. In the late afternoon, with not really enough money between us to at least go and have a beer with the old blokes in the corner bar. We waited. I was a crap manager. We were having a crap time. All this other stuff was way less fun than playing music. It seemed pointless. The gig was underpopulated and unremarkable. Two other bands. One was called the Bam-Bams, in which Peter Cossar (future Kundelini) played bass. I don’t recall being paid. Morale was rather… low. Rehearsals stopped as we tried to finish uni. Our last gig was at a backyard party in Tarragindi. A girl I was seeing had asked us to play. Then we broke up. But she still wanted us to play her party. The band had broken up too, but a little money was being offered. We turned up and did our set. I recall the parents being there, unimpressed. It might have been a 21st. I felt like apologizing to the girl who’d invited us to play. And the band.Talk about insult to injury. We loaded the stuff back into the car. Walking up the sloping driveway, somebody slapped me on the back and said we sounded like the Velvet Underground. I’m not sure it was a compliment. We were still talking to each other, but the weight of ‘stuff’: bad management, bad music, hard work, lack of income, lack of shared goal, life stuff and complicated relationships inside and outside the band dulled the velocity of joy we’d initially experienced in making music together. 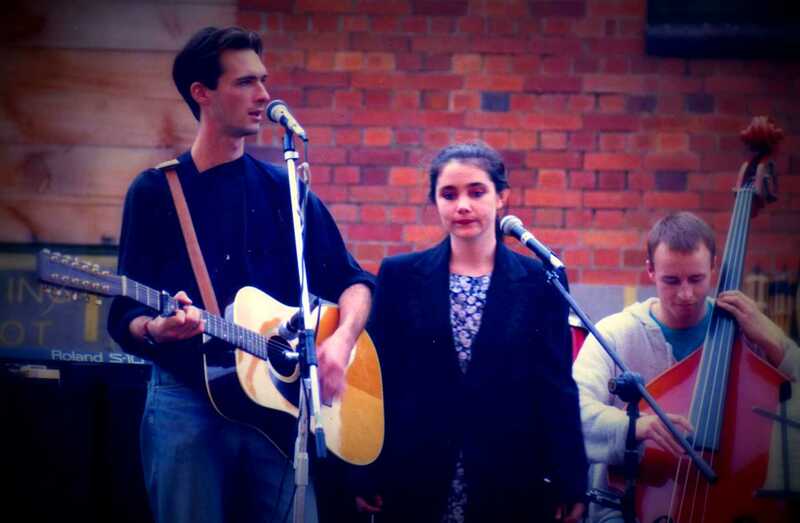 Julia and I formed the short-lived ‘Lovelies’ , played one gig and folded. Perhaps it was bound to fall. But I’d rather have flown than not at all, however shallow the arc. Velocity. Gravity. Time. A clean parabola. Like that bar of soap. Jesus Mary and Joseph! I think you and Julia would’ve been much better on your own!!!!! I’m currently residing as Julie D and was going through somewhat of a dirty blues phase. My hero was actually “Big Mama Thornton” I have never actually enjoyed “white blues” because it sounds exactly like I sounded in this blip!! 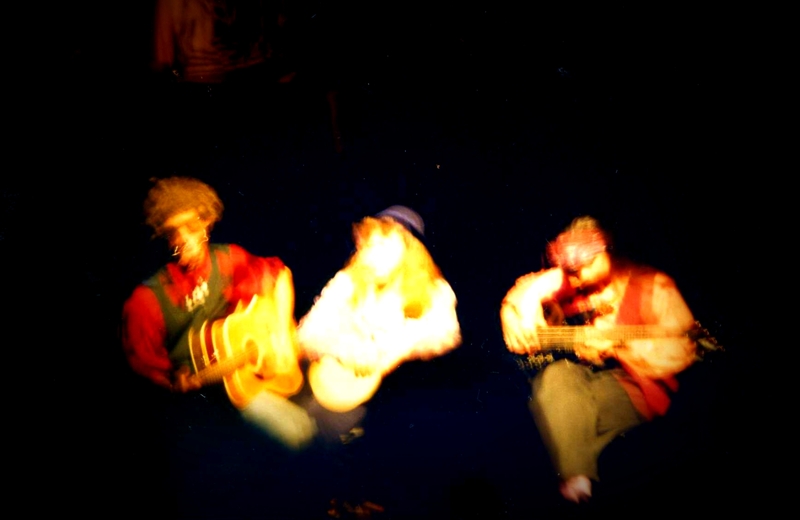 I believe we had more fun than the music, which is probably a testament to the liveable 90’s. I wouldn’t mind seeing a Julia and David and Susan reunion? These days my favourite band is “Low” and I like a bit of “John Grant”. I hope all the “Lick Me’s” are healthy and still musically curious.